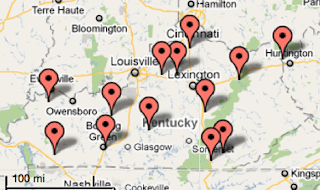 There are 13 USHCN stations in Kentucky, starting with Ashland, and ending at Williamstown. If one looks it does appear that the locations strongly favor the highway network in the state, relative to the blank areas between them, but so it goes. 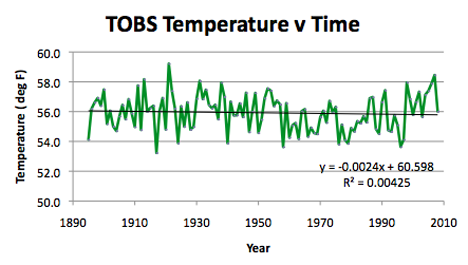 There are two GISS stations on the list. These are at Louisville and Lexington. 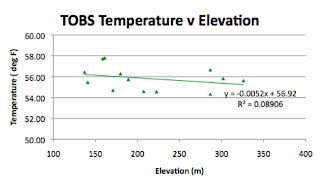 And so the first thing to do is to collect the data. 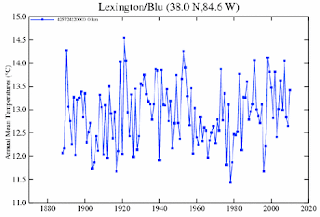 There are, as it turns out three Lexington’s (GISS is still showing me European sites when I click on the map selecting Kentucky, go figure!!). Lexington/Blu has the right co-ordinates. 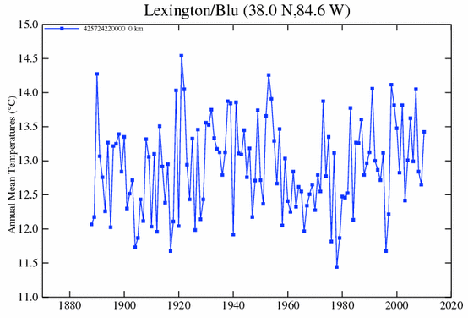 Lexington KY GISS station temperature plot. 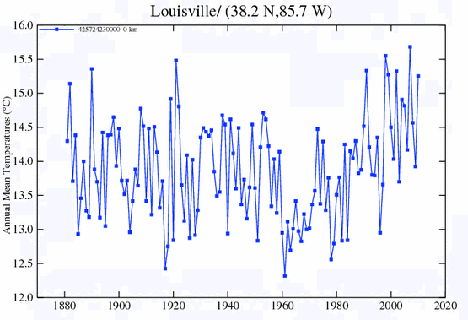 And there are two Louisville stations and the one with the correct location also has data back to 1880. 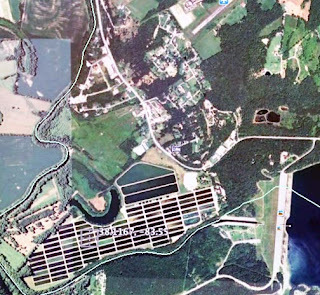 Looking at Farmers KY through the Zip-code site gives a population of zero, but a glance through Google Earth shows an airport and a dam within walking distance. These lead me to give it a population of 50. 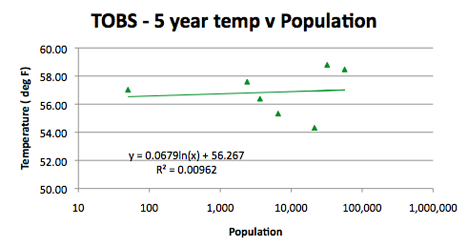 (Though when I look at the plot later I suspect I should have made it significantly larger). 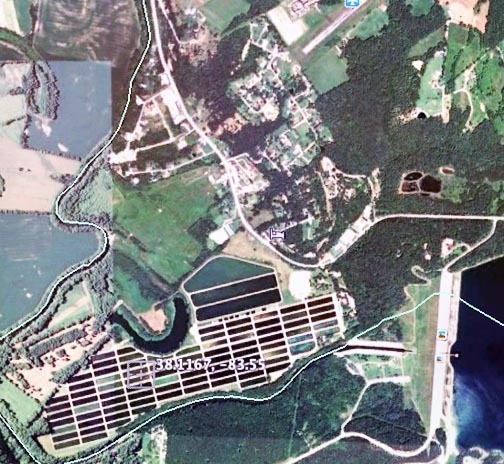 View of the USHCN station (where the numbers are) at Farmers, KY, using Google Earth. 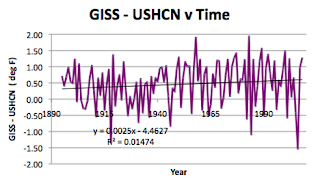 Looking at the data, there is almost a constant average half-degree difference between the GISS station average and that of the homogenized data for Kentucky, using the USHCN stations. Difference between the GISS station average and that of the USHCN stations, after that data has been homogenized. Using the Time of Observation corrected (TOBS) temperatures, the temperature of the state actually fell over the 115 years of the period examined. 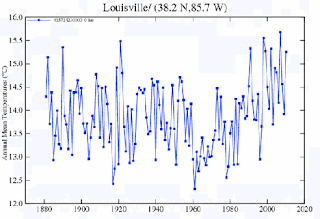 Average temperature (Time of Observation corrected) for the USHCN stations in KY.
Incidentally when the temperatures were homogenized the average showed a slight temperature rise over the period, but only 0.06 degrees per century. 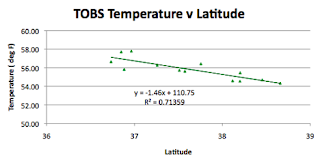 Looking at the geography of the state, Kentucky runs from roughly 82 deg W to 89.5 deg W, and from 36.5 deg N to 39 deg N. It is 380 miles long and 140 miles wide. The center of the state has a latitude of 37.36 deg N, whereas the USHCN stations center at 37.6 deg N, and the GISS stations at 38.1 deg N. The elevation of the state varies from 78 m to 1261 m, with a mean elevation of 228 m. The average elevation of the USHCN stations is 212 m, and for the GISS stations 222 m.
However the plot here showing a significant interaction between temperature and elevation helps explain why I prefer using the TOBS data to the homogenized data that USHCN offer. 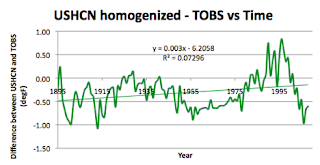 If that plot is examined, as an example, one can see that the homogenization has removed the sensitivity . 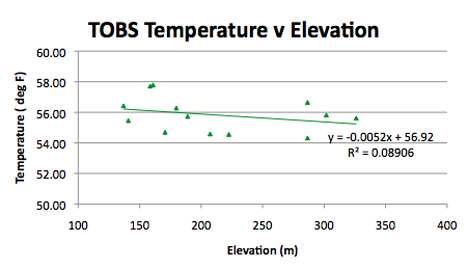 Plot of homogenized temperature average for the USHCN stations as a function of elevation. 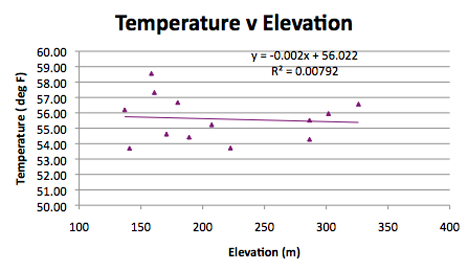 (Note the change in the R^2 value). The downside to using the TOBS data is that there are years without data on the USHCN site, hence their desire to fill in the data, and use the homogenization process to establish numbers that are not in the data base. 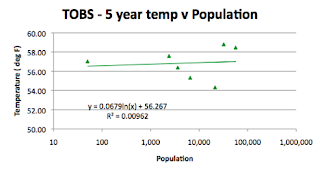 And in Kentucky there are a significant number of stations with no TOBS data over the past five years, so that when I plot the 5-year average against population, the lack of a sufficient data base makes the correlation poor. 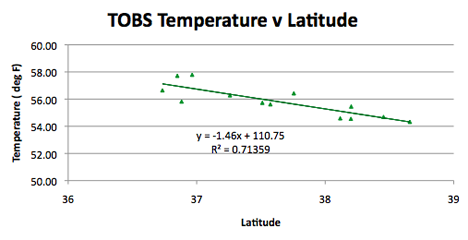 The drop out in recent temperature data may also explain the rather odd (relative to other states) plot of the difference between the homogenized data and the TOBS for Kentucky.